Whew, what a week ahead. There’s still so much to do! My book launch is coming up this week. I know, I know, the book came out ages ago technically, but I never had a launch. With all the work and emotion poured in, it feels like there should be a party of some sort, no? So it’s coming up. If you haven’t checked out http://www.strikingly.com/booklaunch for the deets – go on and have a browse. 🙂 A little thrill for me this week was having my story shared in the metro. Since this exposure was for Ottawa, I’ll link you a pdf if you want to check it out. So yes, creating a book launch. There’s a load to do considering it’s on Friday. I have a definite threshold on what I’m capable of managing, and my mood cycles between wonder woman and emotional mess on the couch with a load of just “normal day” in between. Normal days are my favourite, but the wonder woman moments are extra memorable. Create Book Launch Bingo: This is for people to have a reason to chat, and something to do at this launch. Events can be awkward or boring without these little bits of fun. Since I am not hot for readings at these occasions, I’d rather have people meet the book through their own exploration. The bingo works really well there. Choose pictures for slides: I’ve got that slide show to set up (people can click through on their own). I love the photographs from my mom’s childhood, plus I turned some book pics into slides too. Hashtag: This thing needs a hastag. 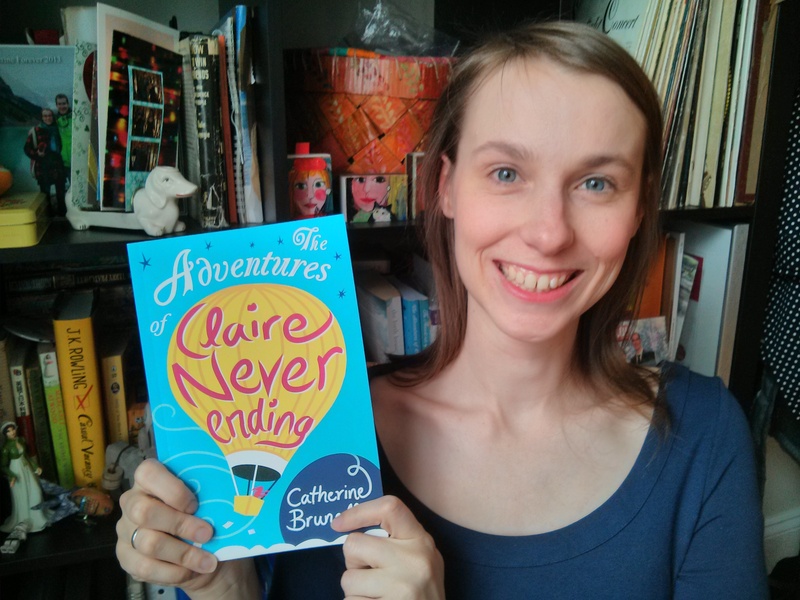 Maybe #ClaireNeverEnding – but isn’t that too long? Food: My mom and my friend have kindly stepped in here to help. One is making all kinds of lovely cookies. The other is sorting out cups, drinks (other than the wine, which I have), nibbles. If life was perfect, I’d have food that ties into the book’s themes – but that’s not going to happen this time. Folks will be getting standard nibbles. Zsolt will be pouring drinks for people. Flow: My friend will also be playing hostess for the evening. So I need to meet with her and explain what she should be saying to people when they arrive (which I plan to figure out today). I’m going to throw music in here because I’m not in the mood to give it its own bullet point. Need to do music too. I’m thinking cafe style music. Silent Auction: I need to set that up. We need clip boards for the bidding sheets, and I need to create the bidding sheets. I need to work out payment methods. While A Fresh Chapter is a registered charity in the US, it is not a registered one in Canada – as in, you can’t get tax receipts. But you can get lovely items like Lise’s paintings, a photo session, or some watches 🙂 Anyhow, must do this. Details: And the details, I need to do the details. What will I say when I finally say something to the group? How will I announce the winners of the bingo and auction? Where should I put the book for sale, and who will carry receipts if someone wants one? Mind you, if all of this fall through it should still be a good time. The book is made, and that’s the best bit! it’s Blog Out Loud. This is a big deal to me. I’ll be reading a Bumpyboobs post from 2013 at the event. Honestly, I have trouble believing my post was accepted for the event. But personal insecurities aside, it’s going to be a wonderful occasion. AND I get to hang out with Laurie from Not Just About Cancer because she was selected too! Amazing or Amazing? Zsolt will be on hand to take pictures during the event, so I’ll let you know how it goes 🙂 If you live in Ottawa, this is an event to not miss – I have a feeling it’ll be attracting many, many great people from the area. It’s one of the only blogging events that I know of, apart from conferenes. No more procrastinating! Time to get to work. Oh, my friend Lou will be snapping pictures at the book launch. How lucky am I?! She’s a wonderful photographer. Now I’m really done. Happy Sunday. It will be great to see you and hear your post on Tuesday! And I so wish I could go to your launch (but I have a hot date with a teenage son). It sounds spectacular! Was reading the “Metro” newspaper on the bus and saw your article which I saved. Looking forward to being at the book launch. Love your picture with the book … the picture sequel to the one with you and your manuscript on Kickstarter. Yay!